While “La Spaziale” may not be a household name to you, but they have a long-standing reputation with espresso enthusiasts for producing great performing, high quality espresso machines. The La Spaziale Mini Vivaldi II espresso machine follows that tradition by packing big machine performance into a small package. How about dual boilers, both nickel plated, and electronic temperature control? What if this La Spaziale espresso machine comes in a case that takes up just 16½” by 16½” of counter space? That's just the start! The La Spaziale Mini Vivaldi II is rated to be able to produce one espresso every three minutes! A compact, high performance La Spaziale espresso machine that fits into a small kitchen space and yet delivers excellent espresso. Once on your counter you will see that good things DO come in small packages! 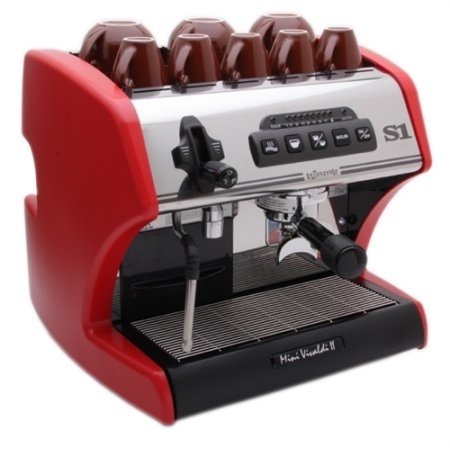 The La Spaziale Mini Vivaldi II, a very good thing in a small package! Dual Boilers – One of the “step-up points” as you move up the ladder to a La Spaziale espresso machine is the jump to dual boilers. The .45 liter boiler serves the needs of making espresso and a separate 1.2 liter boiler holds steam for making microfoam (for lattes and cappuccinos), and hot water dispensing. Why two boilers on the La Spaziale Mini Vivaldi II? When one boiler is dedicated to making espresso it can be always filled with nothing but water (no steam). Instead of a few ounces of water as is found in a heat exchanger, the La Spaziale S1 Mini Vivaldi holds around a pint of water at your preferred temperature. That means a La Spaziale espresso machine gives greater consistency and better espresso with less hassle. Highly Accurate Digital Temperature Control – Having a separate boiler for brewing espresso is just the start. This La Spaziale espresso machine has a row of display LEDs that allows you to monitor and adjust the preferred brewing temperature. You will know just by glancing at the La Spaziale Mini Vivaldi II what temperature the brewing boiler is at. Adjustable Offset – This functions allows the user to make an adjustment so that the display indicates what the temperature of the water is when it reaches the coffee, not the water in the boiler. Sound technical? No problem! Each La Spaziale Mini Vivaldi II is adjusted before shipping! No need to purchase expensive digital meters and probes just to get accurate temperature readings from this La Spaziale espresso machine! 15 or 20 amp operation – An internal switch allows the user to select 15 amp operation or 20 amp operation. When using a standard 15 amp household outlet the La Spaziale S1 Mini Vivaldi operates one boiler at a time, automatically switching back and forth as required with no user input. If the 20 amp mode is selected then both boilers can operate simultaneously. The 15amp mode is sufficient for most home users while the 20 amp mode is best for small cafe or office use. 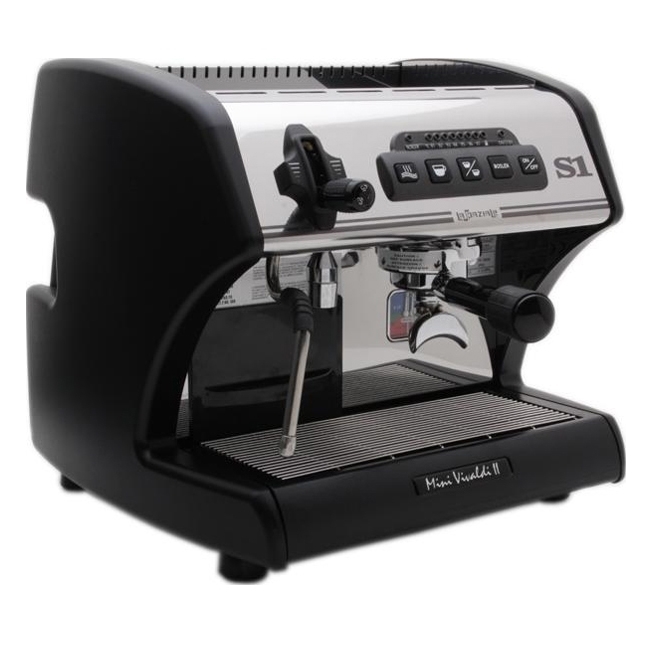 Note that the user must have a special 20 amp outlet and 20 amp circuit breaker to operate their La Spaziale espresso machine in the 20 amp mode (consult an electrician for details). Easy to Access Water Reservoir – No more taking all the cups off the cup warmer on top of the machine or having to pull out that heavy espresso machine out from under a cabinet just to fill the reservoir. The S1 Mini Vivaldi's 80 oz. reservoir is located on the front of the machine under the steam wand. It pulls out like a drawer. Just that easy! Automated Brew Volume – There are two auto brew buttons on the face of the La Spaziale Mini Vivaldi II. One has an icon of a single cup and the other displays two cups. One is for brewing a single espresso and the other for a double. Want a double? Prepare the double basket, press the double button and the correct amount of water is brewed through the coffee into your cup. The volume of water dispensed by either button is easily programmable by the user on the SI Mini Vivaldi II La Spaziale espresso machine. Lever Operated Steam Valve – Dispensing of steam for frothing milk is controlled by the lever arm on the face of the machine. It will hold any position along its range. While that is easier than turning a knob-style valve, the greatest benefit is that it can be very quickly turned off at the moment you choose by simply pushing it down to its stop. Much better then trying to turn a knob with one hand while holding a pitcher of hot milk with the other. Combine that with the special 4-hole steam tip and you have the opportunity to produce excellent microfoam with this La Spaziale espresso machine! Dual Gauges – A single gauge with dual needles. One indicates the pressure in the steam boiler (an indirect measure of the temperature), and the other needle indicates the brew pressure when making espresso. No need for a separate tool to adjust the brewing temperature! Improved Temperature Accuracy – A newly designed temperature probe as well as a more accurate electronic control system provides even more precise control over the brewing temperature, one of the most important factors when striving for that perfect espresso! Improved Temperature Display – The La Spaziale S1 Mini Vivaldi has a row of LEDs to indicate current brew temperature as described above. These now indicate steps of one degree Celsius (1.8 F.). Programmable, 7 Day Timer – How nice would it be to have your La Spaziale espresso machine ready when you get up in the morning? An optional timer plugs into a socket on the motherboard of the La Spaziale Mini Vivaldi II and allows you to set the time the machine turns on and off each day. Optional Preinfusion Chamber – Preinfusion lets the espresso machine deliver a gentle soaking of water for about 6 seconds, slowly ramping up the pressure until the full brew pressure is being delivered to the coffee. This helps avoid “gushers” and can improve overall extraction and consistency. This can be installed inside the machine by the user at a later date, but order this option with the machine and we will install it for you! Optional Longer Steam Arm – A longer, no burn steam wand is available for those who want more room to work their pitcher, or for those who want to use larger pitchers. The longer, no-burn wand also makes cleaning the wand easier (less burned-on milk) and, as the name implies, is cooler to the touch to greatly lessen the chance of being burned as the result of an errant touch. Optional Plumb Drain Kit – It is possible to connect the drip tray to a drain line. This eliminates carrying a tray of waste water to the sink for disposal. We bought this double pump machine to replace a single pump Rancilio. Love it! Faster and more powerful.